“I am a barrister and solicitor and a partner in the law firm of Corcoran French, with offices in Christchurch and Kaiapoi , New Zealand ( South Island). I have had a long interest in British cars which were the staple diet for motorists here in my youth, before the Japanese invasion. There were special tariffs to make British cars price competitive but those days have long gone. My first car was a 1957 Ford Prefect 100E bought in 1969, followed by a Ford Capri and then Rovers , Jaguars and Daimlers over the years. I have been in the RSR, and NZ Jag , Daimler and Rover clubs for over 35 years. Present vehicles owned include a Rover 16 (P2), 1964 Daimler V8 (2), 2008 Jaguar S Type R ( one of the last) and a newer BMW 118i and wait for it a Suzuki Kizashi AWD Sport which is my everyday runner (and a much under rated car). 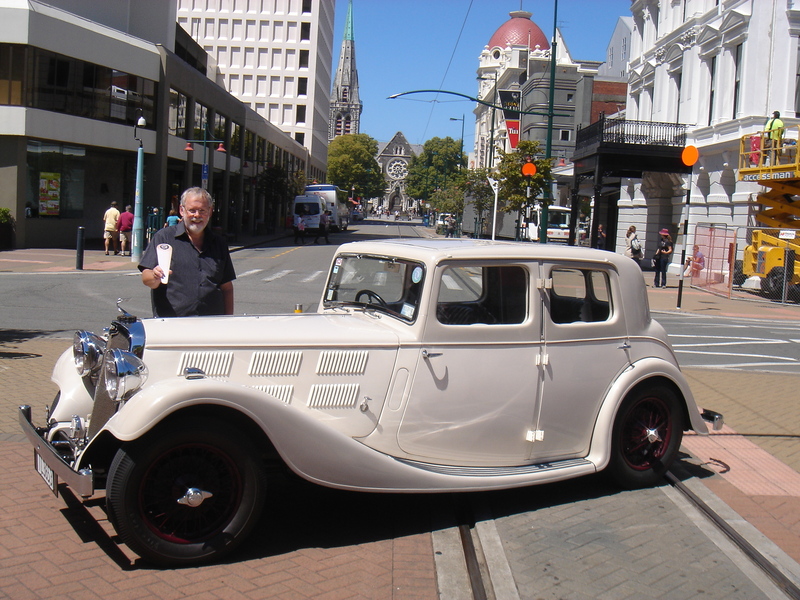 I briefly owned a Triumph 2.5 years ago but my interest in pre war Triumphs began about 7 years ago when I spotted a 1935 Gloria 6 for sale in Christchurch. The car has a good history being owned for 40 years by the late motorcycle genius John Brittan, and his widow was finally selling it some 13 years after his death in 1995. A full restoration was completed by world class Autorestorations in Chch weeks prior to his death for approx. $120,000, today it would cost over $200,000!. John died aged 45. Hence a new car with a good history and seductive body lines. After 6 months of negotiations she was mine and I joined the club. This is a rare car in as new condition and is only used on fine days and not on shingle roads! The car has featured in 2 magazines, Classic Driver no 25 and New Zealand Classic Car issue 266, which I think can still be purchased from their publishers. The Gloria and I featured on the cover of the club magazine in front of Christchurch Cathedral around Feb or March 2011. The Cathedral was almost destroyed in the devastating earthquake of Feb 22nd 2011,( and may still be demolished) about 3 weeks after my photo was taken in January and before the picture was published! The earthquakes have been very traumatic for all of us here. Also do check out John Brittan, an amazing man with an international following, not unlike Bert Munro with the Worlds Fastest Indian. In Christchurch there is a small group of 8 pre war Triumph owners and we meet monthly for a meal. I am still hoping to increase NZ membership and advertised last year in Beaded Wheels, the NZ Vintage Car Club magazine. I need to find time to complete the NZ Register but until retirement time remains an issue. I am married to Phillipa and last week we celebrated our 40th wedding anniversary.